The rhinoceros is a symbol of wisdom, patience and stability, and also of solitude. But the name Rhinoceros chosen for this place, a complex of three residential buildings constructed over time starting in the second half of the 16th century, on an embankment next to the Arch of Janus, is above all a reminder of Imperial Rome, the capital of a vast empire – caput mundi – and all its wonders, for which the then-unknown animal from distant lands was a prime example. Suetonius narrates the astonishment of the people when the emperor Augustus showed the beast to the citizens at the Saepta Julia, the place set aside for the gathering of cast votes. 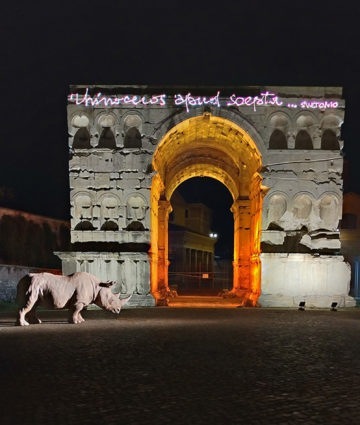 Rhinoceros AT Saepta is the name of the installation by Raffaele Curi, artistic director of Fondazione Alda Fendi – Esperimenti, which was seen as a laser display on the Arch of Janus during the days of the opening of the complex. A realistic fiberglass rhino with Fellinian overtones stood still in front of the monument. 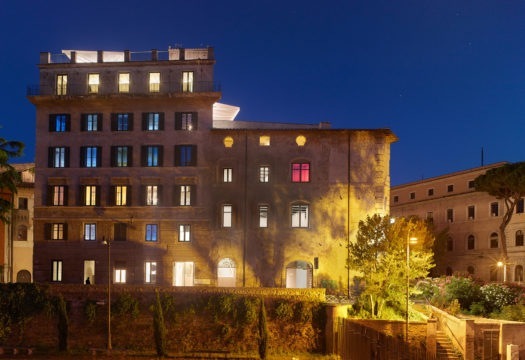 Thanks to the efforts of Vittorio and Francesca Storaro, it was lighted from inside with an orange glow that rose from the ground, shifting to yellow like the splendid daylight of Jove. The exterior, ‘washed’ by grazing white light, enhanced the ancient architectural figure. The installation linked back to the idea of wonder and amazement prompted by the rhinoceros of Augustus, which the architectural project – exemplary in its method in the field of contemporary restoration, like that of David Chipperfield for the Neues Museum in Berlin (Interni, May 2009) – also pursues in its final synthesis. In this project Jean Nouvel puts the accent on the importance of recovery and transformation of the urban artifact, in this case a cluster of old, anonymous buildings seen on a part with ‘monuments’ or ancient ruins. 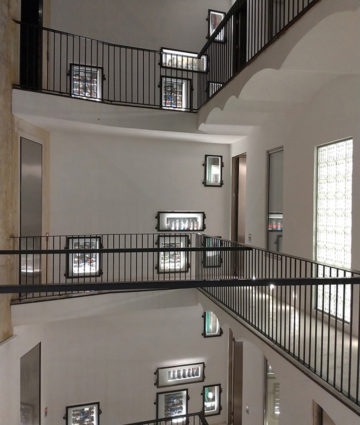 The 25 apartments – The Rooms of Rome – have been created inside the existing buildings, together with the exhibition spaces on the ground floor, which become a natural indoor extension of the surrounding public space, joined by the landings and connective spaces on the various levels, which offer other places to insert art in its widest range of expressions. 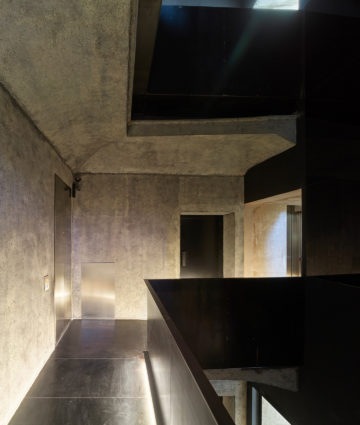 The rooms are organized around two internal cavities; the first, dark and crossed by passages in black waxed sheet metal, evokes the magical and dramatic atmospheres of Piranesi’s Prisons; the other, white and luminous, captures natural light from above, framing the sky, and is ‘activated’ by a series of small incandescent windows. They are actually the junction boxes of the physical plant systems (usually concealed by architects), which here – thanks to a conceptual and compositional leap – are literally ‘placed in light,’ illuminated by internal LED borders to reveal the ‘veins’ of the new, powerful yet gentle Rhinoceros. Each apartment tells a different story, legible in the traces, colors, graffiti, the pale plaster brought back to light on the walls. Inside, they contain essential ‘capsules’ of steel, complete, independent units: monolithic volumes that host bathrooms and kitchens in a range of solutions to adapt to the various layouts. In the programmatic absence of any form of decoration, the ‘narrative’ value of the project emerges: design pieces that add a selection-tribute to the history of Italian design are joined by custom creations, the haiku poems placed on the doors by Raffaele Curi, and the invention – again by Nouvel – of a remarkable ‘literary device’ to convey the ‘figurative memory’ of the interiors as they were in the past into every room, placing it on the urban stage. A high panel that folds in two sections and rotates on a lateral pivot is placed beside each window, like a shutter, to protect the rooms from light during the day and darkness at night. The surface bears large color photographs of the rooms prior to the project; thanks to a light on the floor below each window sill, when the panel is turned by 180° to screen the window, in the night the view of the former room is presented to the city, in a mosaic of anonymous memories. A project that in the ‘complicity’ between the architect and the client, between Jean Nouvel and Alda Fendi – “complicity is the only guarantee of progress […] all great works of architecture have been developed through complicity,” Nouvel says – brings the value of ‘narrative complexity’ to the discipline of contemporary restoration, where poetry is all too often still absent. The two cavities around which the spaces of the Rhinoceros are organized. The dark one (photo by Roland Halbe, facing page) with passage of black sheet metal suggests the atmospheres of the Prisons of Piranesi. The white cavitie (© M.V.) frames a piece of the sky, and is activated by a series of small luminous windows: these are the junction boxes of the physical plant systems, seen as the veins of the new architectural organism. 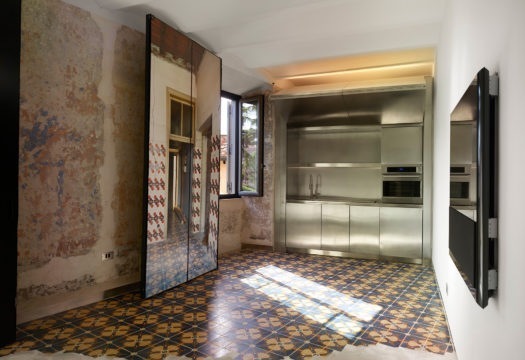 A dining-kitchen zone that conserves part of the existing tile, approached like an antique Roman mosaic (photo Roland Halbe). 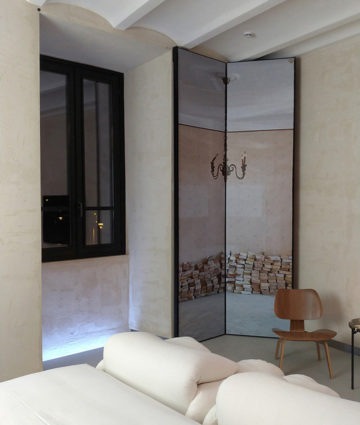 View of a bedroom with the swivel panel to screen the window, bearing a large photograph of the room before the project began (© M.V.). The seat is the Plywood Group DCW by Charles & Ray Eames for Vitra. When turned by 180° to act as a shutter, the panels lit from below create a fascinating mosaic of memories offered to the city (image below, © R.H.). 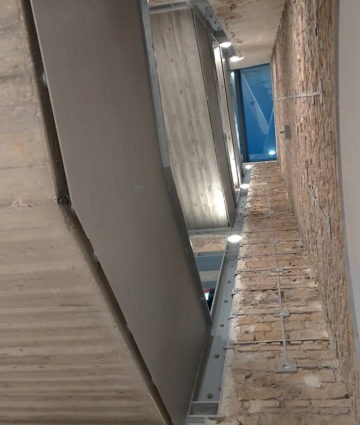 View of the main staircase in fair-face reinforced concrete with metal sides, inside a stairwell in brick reinforced by structural screening (© M.V.). 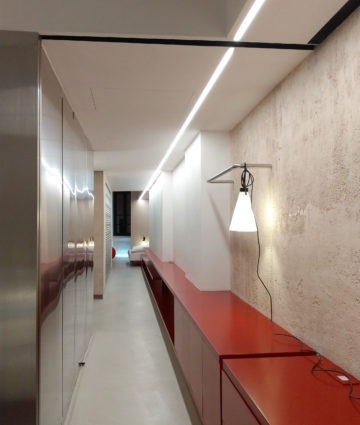 The living area of an apartment: the independent blocks of steel, custom creations produced by Devoto Design, contain bathrooms and kitchens, creating a forceful dialectic relationship between conservation and contemporary image. 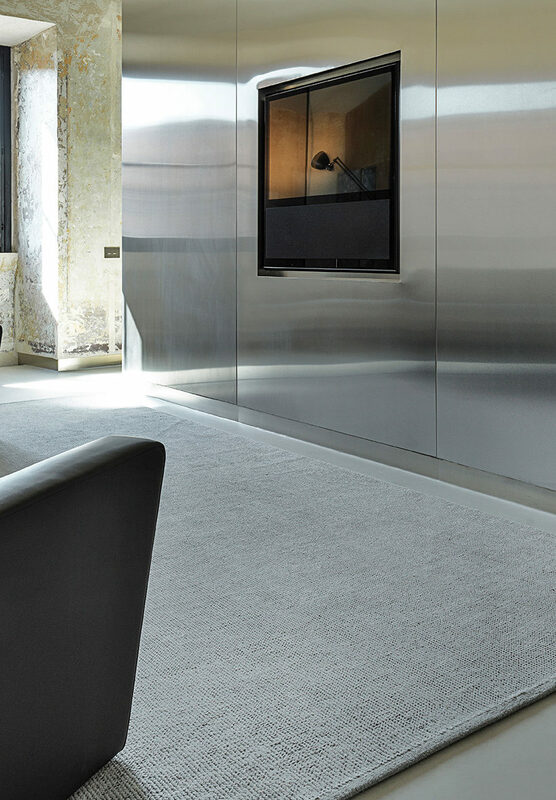 Vienna upholstered furniture by Jean Nouvel for Wittmann. (© Gionata Xerra). Perspective view of a corridor connecting the bedroom zone and the living area. The red cabinet, a custom piece, runs along the wall, transforming as a storage unit, shelving and bed. May Day lamp by Konstantin Grcic for Flos. Facing page, the steel block of the kitchen alternates with a wall in glass blocks (© M.V. ).